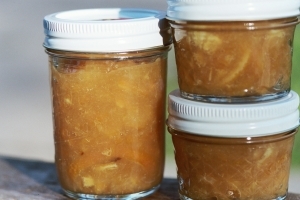 lemon marmalade: a good introduction? Slice lemons, removing seeds and the green stem bits on the end. If you like small pieces of lemon, chop roughly. Put in a large, wide pot and fill with cold water until lemons are covered; bring to boil and cook 10 minutes more. Drain and rinse. Return lemons in pot to stove, and add 1 cup water and sweetener (you can adjust sweetener later, so err on the low side). If desired, add a cinnamon stick, freshly grated ginger, or (as we did) a few teaspoons of ground ginger mixed with honey and a little hot water to avoid lumpiness. Bring to boil and simmer about an hour, stirring often, until mixture is thick and syrupy and lemon peel is tender. Test for sweetness (we had to add a lot to make it less bitter), remove from heat, pour in jars (we used 4-ounce jars), place lid and rings on top, and process in a water bath for 10-15 minutes. It was so simple and worked so beautifully that I wonder if marmalade might be the best introduction for the canning-averse. And its season in January makes it a good way to learn a skill and develop a yen for the art before harvest season arises. What do you think?